TVSA is proud to offer the TOPSOCCER program for the Temecula Valley’s youth with special needs. TOPSoccer is designed to bring the opportunity of learning and playing soccer to our many disabled young athletes. The program is structured for athletes 4 years of age and older. TOPSoccer stresses player development rather than competition. Athletes are placed on teams according to ability, not by age. The program is structured for athletes 4 years of age and older and open for a wide range of disabilities. TOPSoccer stresses player development rather than competition. Athletes are placed on teams according to ability, not by age. 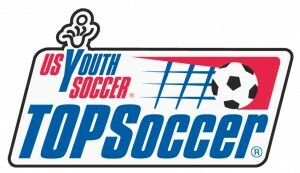 TOPSoccer programs are entirely dependent upon the power provided by volunteers. Volunteering brings more awareness and understanding to the special needs community. You can even receive community service hours by helping out a TOPSoccer program. But beyond the service hours, TOPSoccer is an opportunity to give your best by making a difference. It could be assisting on the pitch with soccer skills or just being a friend and cheerleader. TOPSoccer relies heavily on help provided by “buddies.” Anyone can be a TOPSoccer Buddy: parents, brothers, sisters, aunts, uncles or friends. It doesn’t even matter if you have soccer experience. If you want to give back to your community and help this vastly under-served part of our population get the chance to participate in soccer, TOPSoccer is the place for you.